Immediate Load Dental Implants in NYC. You do not need to wait three to six months for the dental implants to be stable enough to support a new dental crown or bridge. It can be done the same day as the implant is inserted. Our dental office uses only the newest and most advanced dental equipment available on the market in USA. Dr. Navid Rahmani is an internationally recognized, Board Certified Periodontist and one of the best dental implant specialist in NYC. 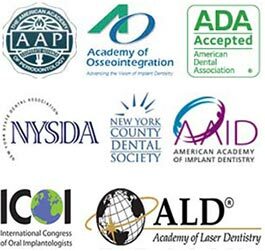 All dental implants procedures are performed on Upper East Side in our Midtown NYC dental center. Conventional single tooth implant treatment requires the dental implants to be left to heal or osseointegrate with the natural bone surrounding them. During this process new bone cells grow on and around the implant posts that are specially treated to encourage this growth. It takes between three and six months for the implants to be considered stable enough to support a new crown or bridge unless its possible to immediately load a dental implant. Nowadays it is becoming increasingly common to immediately load the dental implant which means a new restoration can be placed on top of the dental implant soon after surgery. This might be the same day as the implant is inserted. The advantage of being able to immediately load a dental implant is obvious as patients can enjoy the sensation of having a new tooth without having to wait months for treatment to be completed. The technique for immediately loading dental implants is extremely precise but it is tried and tested and long-term results are comparable to conventional dental implant treatment. With immediate loading, the implants must still heal and integrate with the surrounding bone and this is taken into account when planning and fabricating the immediate prosthesis that is used directly after implant surgery. The new dental implant crown or bridge is often a temporary prosthesis. It will have been carefully constructed to be slightly out of occlusion, meaning it will not bite or connect with the opposing teeth. This is particularly important for single implant crowns as any movement caused by biting down on the implant could lead to its failure. By ensuring the implant crown is merely for cosmetic purposes, osseointegration can still occur with the implant crown being replaced with a permanent structure after osseointegration is completed. Where an dental implant bridge is used, it is constructed so the dental implants are virtually locked together and cannot move, ensuring that osseointegration can still take place. Immediate loading may not be suitable for everyone, which is why Dr. Rahmani carefully assesses anyone wishing to have dental implant treatment and he will always recommend the option he feels will provide the best and most long-lasting results. Even if immediate loading cannot be used, then conventional dental implant surgery will only take a few months longer while the results could last for life.